Yesterday, I nommed the first ripe Lollipop tomato – a yellow variety of cherry tomato – and it was amazing. Sweet, tangy, very flavorful. There was only one, and I didn’t have my camera… and it didn’t quite make it back to the house before I couldn’t resist its charms. However, here’s what they look like. 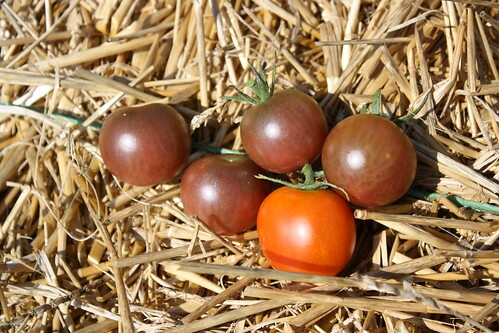 This morning, four chocolate cherry tomatoes were ripe, as well as another glacier. The main things to be said of the glacier variety are the abundance of fruit and the early ripening; however, the flavor is somewhat bland. The chocolate cherries, though? Holy wow, those are great. Sweet and rich with a deep flavor. Plus, they’re just so darned pretty with their slightly purple translucentness. None of the other varieties show any sign of changing color yet, but that’s ok. We’re patient. Maybe I’d better go check again, just to see if any have started turning in the last half-hour.